Today is the last of our guests from the lovely Bethany of bspokeblog and emmylu. Unlike Kara, Claire and Alycia, Bethany isn't new to guest blogging here. She's been so kind to do it before a few times! So a big welcome back to her. Today she is here to share a bit about how she uses and reuses a practical item in a beautiful way. First of all, thanks to Mrs. Limestone for having me again as a guest blogger! I so enjoy her blog, and it's a treat to write for you, her readers. Today I want to share with you a few ideas on how to use glass jars in your home and in your decorating. I live in a small cottage in Minnesota, and tend to decorate using a subtle, natural style. Jars are one thing that I use all over my home to hold everything from dog bones to candles! Read on for ideas on how to use this thrifty and fun item all over your own home. 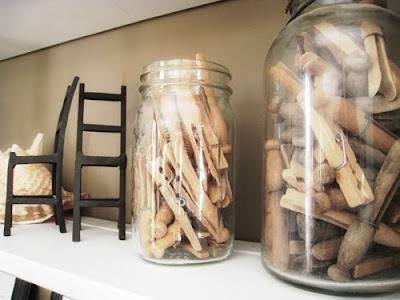 Pictured above, a couple jars sit on display on a shelf in my living room holding clothes pins. Multiples of the same thing have a dynamic, but calming effect. There is a look of consistency, but the trio (third jar not seen in this picture) creates visual interest. My husband and I have a fun tradition of collecting multiples of one item from every vacation we take. We put these little collections in jars and display them on a shelf. Here you can see driftwood from a trip to Door County, Wisconsin and smooth pink and gray stones from a trip to the North Shore of Lake Superior. 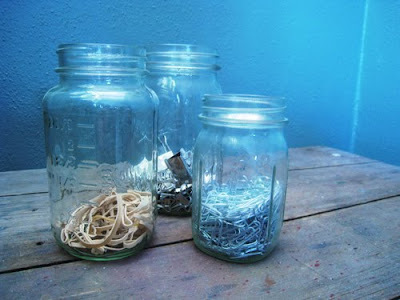 In my studio, I have jars to hold rubber bands, large clips and paperclips. Since they look so lovely on my desk, I can keep these necessities close at hand for maximum convenience. In my bathroom, I have two jars perched atop the toilet (since we have literally zero counter space) holding q-tips and cotton balls. My kitchen counter is host to this trio of jars that hold loose change, dog bones, and clothes pins (for sealing up bags of opened bags of chips, etc). 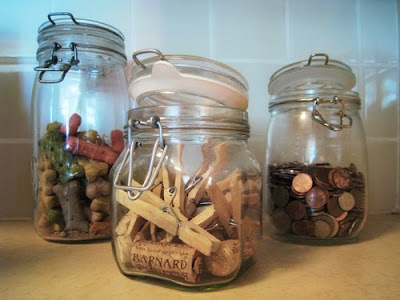 I also toss wine corks in the clothespin jar to keep things interesting. 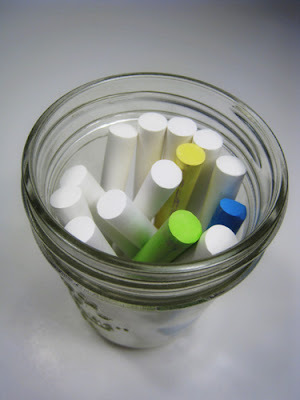 Back in the studio, I have this small jar holding sticks of chalk that I use on a small chalkboard frame (see tutorial on how to make your own here). 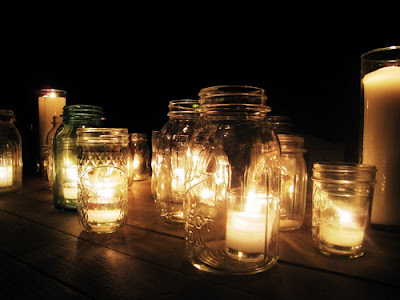 ...nothing compares to the beauty of all those candles burning brightly in the many glass jars! 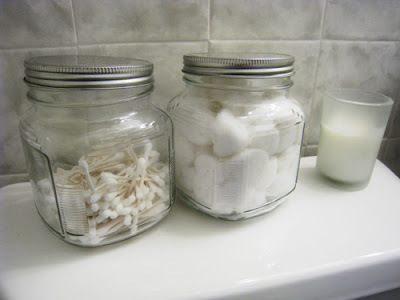 The very best part about decorating with jars is that they are extremely cheap and easy to find. Most of mine were found at garage sales for pennies a piece. Often people who are into canning will sell a whole box of old jars for only a couple bucks. I scoop them up whenever I find them, and always put them to good use! - fill with dirt and place herbs in the jar... how lovely some basil or parsley would look growing out of a jar! I hope you have enjoyed this little collection of ideas for using jars around your home. If you have any other ideas that I did not mention, feel free to chime in and leave them in the comments. I have many jars and am always looking for creative, new ways to put them to use! A huge thanks to Kara, Claire, Alycia and Bethany for taking over for a few days. I hope you enjoyed a break from hearing me blabber on about me, myself and I.
I LOVE the candles on the patio, that's such a great idea. I enjoy canning & always pick up jars when I see them. 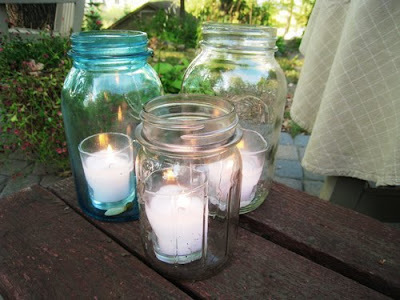 I love jars as candle holders, they give off such a pretty light. 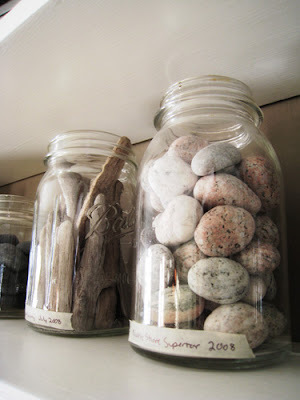 I also really enjoy your idea of collecting items such as drfitwood and rocks as souvenirs, and displaying them so. Very simple and very pretty. A love jars, but lack ideas for actually using them. This post was a huge help - thank you! All of your ideas are beautiful! What a great post! I absolutely love the look of using jars! I love jars. A few uses I've found for mine: I keep one in the laundry room to put loose change from the dryer in, I keep one (or a few) in my art studio for paintbrushes, and my favorite use is to use them as regular drinking glasses. They make any beverage look charming, and it's pretty fun to sip out of them, too. Loving the candles at night - romantic!! So versatile and beautiful. I love the classic look. Any tips on where to find jars of all shapes and sizes at a good price? Great ideas. I'm always looking for jars too when thrifting but I get caught up in making sure they have lids...which clearly they don't need to have! LOVE that idea of a 3 dimensional scrapbook. That's so wonderful. I've thrown so many things away that I collected and didn't know how to display it sickens me! Throw away no more! What great ideas! I love the look - so simple and inexpensive, yet packs a visual punch. Wonderful ideas - we have jars that we use for flour, sugar, and I love them. I also love clear cookie jars with the lid, I have one on my counter which my kids love. Perfect! We have so many jars left over from our wedding (used for candles and flower arrangements). I love these ideas for incorporating them into our home. Thanks! i've always loved glass vessels of all sorts, and mason jars in particular. such a great post as always, hope you're having a wonderful week my dear! I love that look as well, especially in the soft blue and green jars. I'm going to be on the lookout for some at thrift stores. Very nice... i love those jars with candles... Romantic! have a nice weekend! I love the idea of the jars with votives. Perfect. Especially ball jars or jelly jars. I really like the idea of the memory jars - I'd seen a couple of examples in London using display cases too. All in a really sweet idea - one of these filled with meaningful bits and bobs would make a really romantic present! Thanks for all those great ideas for the jars. I love jars. I have a bunch of old jars with the separate clamp on lids that I use in my kitchen. I keep dried beans, oatmeal, popcorn, rice, granola & many other things in them. Love that summer night photo - will have to do this, especially because our porch is not sufficiently lighted at the moment. That will be a perfect (and economical) way to display multiple candles! how perfect is this post! i have tons of jars (from spaghetti sauce, jams, etc...) and was running out of ideas on what to use them for. i used some for baking supplies (chocolate chips), oats, etc... and didn't know what else to do with the ones i have. some EXCELLENT suggestions here! never thought to use them for votives or for herbs! Beautiful and so simple. Must start saving my honey jars. I'd like to fill them with colourful sweets and beads. Candles-in-jars will get pride of place alongside my bath - without risking being quenched by my splish splashing! Yu have a fantastic blog! I love it! I use old canning jars to store pasta, bread crumbs, spices etc.in my pantry. I also use them to store ribbon in my studio and beach washed glass that I find on one of two local beaches( I tie a tag around the top stamped with the year that it was collected.) I get my jars for 10 cents each at the local thrift store. I love this post. Canning jars are so simple and still so beautiful! You've shown some beautiful uses for those Ball Jars that my wife and I have found while shopping at antique stores, and even a few thrift stores. Very imaginative!